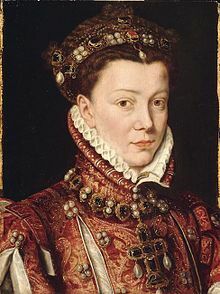 Elizabeth de Valois (called Isabel in Spain) was born on April 2, 1545 at the royal palace of Fontainebleau. She was the second child of King Henri II, then Duc d’Orléans and his wife Catherine de’Medici. 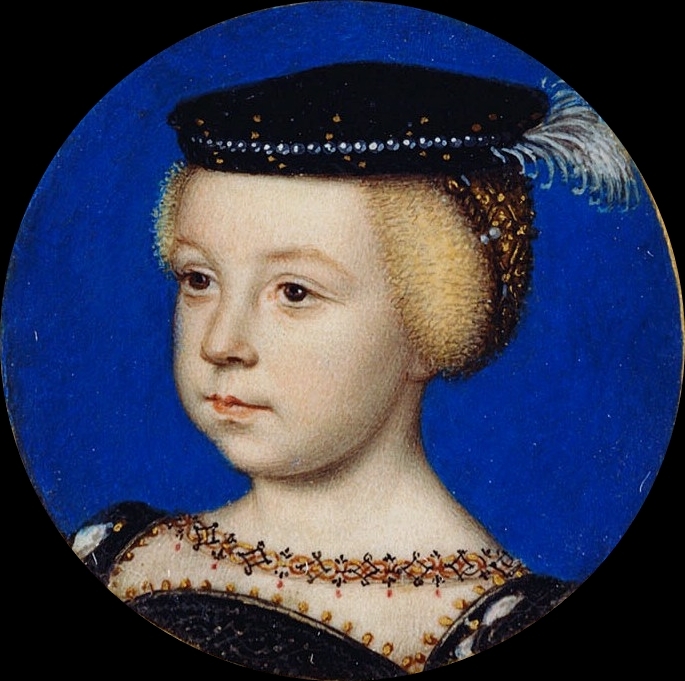 She was born during the reign of her grandfather King François I. There was a magnificent baptismal ceremony for Elizabeth at Fontainebleau. Elizabeth’s mother was given full authority over the rearing and education of her daughter and the Queen decided she should be taken to St. Germain-en-Laye where a large household was established. She was given a nurse, chief dresser, lady governess, physician, rockers, ladies maids and valets-de-chambre. Elizabeth suffered from the usual variety of childhood ailments. She grew to have a round face with an olive complexion, large, lively dark brown eyes, long nearly-black finely textured hair, a delicate and well-proportioned slim figure with a small waist and majestic comportment. In November 1547, a new baby sister Claude joined the household and in the following year, Mary Queen of Scots came to live with the princesses after she was betrothed to Elizabeth’s elder brother, the Dauphin François. The management of Mary’s household and education was supervised by her maternal grandmother, Antoinette de Bourbon, dowager Duchess of Guise. A new tutor was appointed for the girls who taught them history, rhetoric and poetry, Latin, Italian and Spanish along with music and dancing and Elizabeth soon became a star pupil. She was vivacious and energetic. The first negotiations for Elizabeth’s hand commenced in 1552 with King Edward VI of England sending ambassadors to France. A marriage treaty was concluded but the wedding never happened due to the Edward’s death in the summer of 1553. Elizabeth was admitted into the court of her mother at St. Germaine at the age of ten. She was her mother’s favorite and both her parents were extremely proud of her. Elizabeth was graceful, had exquisite manners and she enjoyed spending time in her mother’s company. While Elizabeth was friendly with Mary Queen of Scots, her closest companions were her cousin Jeanne d’Albret, Duchess of Vendôme and Anne de Bourbon, Duchess of Montpensier. The conference of La Marque opened in May of 1555 to negotiations for mending the differences between the Holy Roman Emperor Charles V and Elizabeth’s father, now King Henri II of France. The English acted as mediators and proposed the marriage of Elizabeth to the emperor’s grandson Don Carlos, son of Prince Philip, Charles’ son. The conference broke up before anything was finalized but the idea of a marriage alliance between France and Spain was kept alive. However, the behavior of Don Carlos, always volatile and unpredictable, began to deteriorate, especially after a near fatal fall down some steps causing a traumatic brain injury. Elizabeth made her first state appearance at the marriage of her elder brother François to Mary Queen of Scots on April 24, 1558. During the post-wedding celebrations, Elizabeth made a favorable impression by elegantly dancing with her sister-in-law and her good friend Jeanne d’Albret. In November 1558, Philip of Spain’s wife, Mary Tudor, Queen of England died leaving him single again. At this point, Philip began to put himself forward as a husband for Elizabeth. A peace conference was held at Cateau-Cambrésis in January of 1559. Among other things, two marriages were agreed upon. 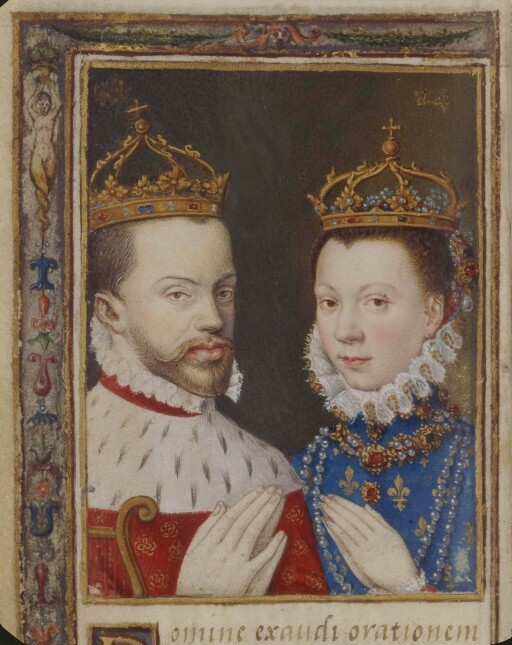 Philip of Spain was to marry Elizabeth with her father providing a dowry of four hundred thousand gold crowns and King Henri’s sister Marguerite was to marry Emmanuel Philibert of Savoy. The treaty was finalized on April 3, 1559. 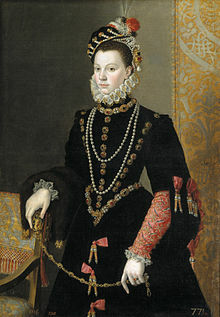 A portrait of Elizabeth was immediately sent from Paris to Spain. Philip was sufficiently charmed by the painting and was eager to conclude his marriage to Elizabeth. Philip sent word to King Henri his ambassadors would arrive in France in June. Plans commenced for a huge celebration of the two weddings at the Palais des Tournelles. Lists for a great tournament were erected. The Duke of Alba to France acted as Philip’s proxy for the ceremonies. The first of these took place in the Great Hall of the Louvre where Alba officially greeted Elizabeth and the marriage treaty was signed. On June 20th the betrothal ceremony took place in the same hall and was performed by the Cardinal de Bourbon. Rings were exchanged and there was a ball and a banquet. The next day the nuptials were celebrated at the Cathedral of Notre Dame. Elizabeth was magnificently dressed and adorned with many jewels and she wore an imperial crown. Once again the Cardinal de Bourbon presided and high mass was performed. Later a banquet was held at the palace of the cardinal bishop followed by a ball and then a masque. The plan was for these ceremonies to be succeeded by the marriage of Princess Marguerite. On June 28th, a massive tournament began with King Henri personally participating. During the king’s run through the lists, he was mortally wounded by his opponent when a wooden lance went through his visor and splintered in his eye and head. Unfortunately Elizabeth witnessed this terrible accident. The Duke of Alba and the Spanish envoys conducted her back to the Palais des Tournelles where she remained in shock and grief. King Henri experienced extreme agony for days and died of his injuries on July 10th. Philip was informed of Henri’s accident and immediately dispatched his personal physician to France. He also sent an envoy to convey his condolences to the royal family and to deliver personal letters to Elizabeth expressing his warm consolations and affection. Elisabeth requested she be allowed to stay longer in Paris to comfort her mother. She remained in seclusion in the Louvre for the rest of the month of July. Philip continued to send her letters and small gifts as tokens of his love. King Henri’s funeral took place and Princess Marguerite’s marriage was celebrated according to the wishes of the dead king. Philip dispatched an envoy to keep an eye on Elizabeth while she and her mother prepared for their separation. Catherine gave her daughter valuable counsel and advice in anticipation of her taking up her duties as Queen of Spain. On August 29, 1559, Philip traveled to Laredo hoping to meet Elizabeth. However, her mother requested a further delay in her departure so she could witness the coronation of her brother François as king. Philip was not pleased. Elizabeth attended the coronation of her brother at Reims Cathedral. Philip had insisted on appointing Elizabeth’s household himself but her mother would have none of this and resolutely named an enormous number of servants herself. This, along with the massive amount of packing required delayed her departure even further. The weather by this time was severe and the roads were blocked with snow when she departed on November 17. Elizabeth’s dismay at leaving France and her mother was as intense as the weight of the thought of her new responsibilities as Queen of Spain. She left her mother at Poitiers on the 29th but didn’t cross the frontier until January 3, 1560, riding on horseback and suffering from cold and fatigue. She was greeted by a huge party of Spanish nobles and officials who accompanied her for the rest of the journey. She went through various towns and was given a state entry into Pamplona. During her sojourn, disagreements broke out between her French entourage and the Spanish servants. Elizabeth received letters from Philip along the way and arrangements were made for her to meet him at Guadalajara in the palace of the Mendoza family on February 4. She arrived in the city and made a grand entry on horseback, impressing everyone with her beauty. She first met Philip’s sister Juana and her ladies, including among others, the Duchess of Alba and Princess Eboli. She entered the palace and at the door of a magnificent hall she was greeted by Philip. Before she could bend her knee to him and going against etiquette, he embraced her and asked her about her welfare to the astonishment of all those in attendance. A temporary altar had been erected in the hall and the couple were married on the spot and given the nuptial benediction. This was followed by feasting, games, shows and other entertainments. The couple would spend six days in Guadalajara on honeymoon and were fully entertained by the duke of Infantado who refused any reimbursement for his expenses. The couple then began their life together. Elizabeth attempted to recreate the atmosphere and gaiety of the Renaissance court in France. She loved parties, plays, masked balls, buffoonery and outings to her palaces, spectacles and picnics. She patronized musicians and artists. She reveled in playing the liege lady to the contestants in jousts that featured Don Carlos, Don Juan of Austria (Philip’s half-brother) and the Prince of Parma, Alexandre Farnese, the king’s nephew. She had a calamitous accident in a carriage on one of her outings which angered Philip. Elizabeth did not like Toledo and was instrumental in Philip’s decision to transfer the capital to Madrid. Elizabeth was still a teenager so she was lazy and self-indulgent. She rose and went to bed at erratic hours and ate whenever she felt like eating. Initially Philip gave her eighty-thousand ducats for her household. This was quickly raised to one hundred thousand ducats but she spent so much money her debts amounted to one hundred and eighty thousand ducats by 1565. A great deal of money appears to have been spent on dancing. She bought three harps, an organ and many viols and flutes and paid for a dancing master. She loved to gamble and played board games and cards or threw dice every day, sometimes borrowing from her servants so she could continue to play and lose. She loved to buy clothes. She would pay to have plays performed for her entertainment. One afternoon’s performance, on Epiphany in 1565, may have cost as much as fifty-thousand ducats. Philip tolerated the frivolity and spending. There were continual fights between Elizabeth’s French and Spanish servants. Early on, some of the French servants were sent home but the bickering continued. Philip didn’t consummate the marriage until January 1562 and slept with her regularly after this when he was at court. In public, Philip always showed her honor and affection. But the Venetian ambassador states Elizabeth gave Philip little satisfaction. When he left to go to Aragon, he did not take her with him. He issued orders that Elizabeth only leave her apartment to hear mass in the palace chapel or to dine. She was not allowed to see any visitors after two in the afternoon and guards were required to seal off her quarters for the night at 10:00 pm. Philip was gone for nine months. Elizabeth decided to take Spanish lessons to better entertain her husband. She became very proficient and when Philip returned in May of 1564, relations between the couple improved greatly. They went to Aranjuez, had picnics in the garden and by July, Elizabeth was pregnant. Along with the usual symptoms, Elizabeth began to suffer from headaches, nausea and fainting. In August, Elizabeth and the king were waiting at a palace window in Madrid for a spectacle to start. Philip’s mistress Eufrasia de Guzmán, who was also pregnant, entered the palace. Elizabeth appeared stressed and blood came from her nose. She left the room and sent a message to the king she was unable to attend the festivities. She was seriously sick for three weeks and lost the baby but fully recovered. Philip spent time at her bedside while she was ill, holding her hand. In 1565, Elizabeth’s mother was promoting the idea of a summit between France and Spain. Catherine de’Medici greatly wanted to meet Philip face-to-face and find practical solutions to religious problems and to arrange marriages for her daughter Marguerite and son Henri to some of Philip’s family. Philip did not approve of Catherine’s policy of toleration towards the Huguenots in France. He refused to attend the summit and only allowed Elizabeth to see her mother if there were no Huguenots in the French entourage. The summit was scheduled to convene in the summer of 1565 at Bayonne on the Spanish-French border. Queen Catherine spared no expense on the meeting, borrowing seven hundred thousand écus. Elizabeth was ecstatic at the thought of seeing her mother again and also spent enormous sums on clothes, jewels and entertainments. Records indicate she spent eighty-thousand ducats when Philip had budgeted fifteen thousand. Elizabeth made a grand entry into Bayonne. Gifts were exchanged, there were ballets, jousts, a waterside picnic, a mock battle and a grand spectacle on the Bidasoa River. Elizabeth took her husband’s side in the discussions to the chagrin of her mother. Queen Catherine noted how her daughter had adopted Spanish dress and manners as well as the hardline opinions of her husband. Philip never was serious regarding these negotiations. Queen Catherine basically folded and abandoned the Huguenots of France. Philip made it clear the meeting in Bayonne was purely a family affair and Elizabeth’s return to the Spanish court was joyously celebrated. Philip was not faithful to Elizabeth but they seemed to enjoy domestic happiness. She became pregnant and Philip began spending two hours a day with her and showed her great affection. He was at her side when she gave birth to Infanta Isabella Clara Eugenia on August 12, 1566. She developed puerperal fever but fully recovered and in early 1567, Elizabeth was pregnant again. She gave birth to Catalina Michelle on October 10, 1567. Philip showed great disappointment at the birth of another girl and did not attend the child’s baptism. Elizabeth loved her two daughters very much and spent as much time as she could with them. Elizabeth became pregnant again soon after Catalina’s birth. On January 18, 1568, Philip had his mentally unstable son Don Carlos incarcerated and barred from inheriting the throne of Spain. Don Carlos would later die in captivity. When Elizabeth heard of the detention, she wept sincerely and commented that Don Carlos had never been anything but kind to her. She suffered from depression over the matter. She spent her pregnancy relaxing, playing cards, quoits and throwing dice, enjoying jokes from her fools and watching plays until September of 1568 when she became ill, gaining a lot of weight. She was fainting frequently, having trembling fits and had weakness and numbness on her left side. She couldn’t sleep and was unable to eat. The doctors bled her and applied clysters while the king comforted her. On October 3, 1568, Elizabeth and Philip heard Mass together. Elizabeth asked Philip to promise he would always support her brother King Henri III and to protect and look after her servants. The King promised. Elizabeth said she had always prayed he would have long life and would do the same when she got to heaven. Philip broke down. A few hours later, Elizabeth gave birth to a girl. Several hours later, both Elisabeth and her daughter were dead. A memorial service was held for Elizabeth on October 24 at the French court. She was buried along with her infant daughter in the Convent of Las Descalzas Reales in Madrid. Philip went into seclusion to mourn and refused to look at papers for over two weeks. At Christmas, he saw the French ambassador who read a letter of condolence from Elizabeth’s mother. Philip wept. That summer, Philip told Catherine de’Medici that his two daughters by Elizabeth were his only consolation. On June 7, 1573, the remains of Elizabeth and Don Carlos were transported from Madrid to the new basilica at El Escorial and the next day they were buried in a vault near the high altar of the convent chapel. In 1654, Philip’s descendant King Philip IV completed the Pantheon of Kings in the Royal Crypt of the Monastery of El Escorial. Elizabeth’s remains were once again transported and re-interred there. Very interesting article! It sounds as though Elizabeth was expected to do nothing except enjoy herself and produce children. This made me wonder when the tradition of royal women doing good works began. I seem to remember that early in her reign, Marie Antoinette was loved for going out of her way to help some of those less fortunate, if she happened to witness an accident or hear about a commoner in need. Hi Claudia, The tradition of royal women doing good works goes way back into medieval times. I remember when I was researching Margaret of Scotland (11th C.), she did many kind deeds for the indigent. Good works were an integral part of the Queenship. I’m glad to hear that! And glad that the tradition continues to this day. It helps justify having royalty. Susan, what a wonderful article. I am a big fan, and we have been on FB together for years. This little gem is really helpful, as I am focusing on France but am aware that the French were married into Spain, and the Low countries. I just finished Fraser’s Louis the XIV. Being Anne Boleyn’s month, I picked up Eric Ives book. Reread Ives biography on Anne which thoroughly discusses her training for her role as a courtier at the French court. Anne was certainly on the scene between the Spanish court marriages between the two countries. Spain is my next hurdle. I love your posts, and I don’t comment as much as I should. Also, FB issues have been a deterrent. Ty for your fine scholarship, wonderful blog, and the years you have devoted to the blog. Thank you for your kind words Jan. Glad to be of help. For Spanish history of the era, you would enjoy Geoffrey Parker’s biography “Impudent King” and also Henry Kamen’s “Philip of Spain”. You would also love “Game of Queens” by Sarah Gristwood. Have fun! A promising young woman; so sad she died so young. Just as she was beginning to mature out of the selfish, pampered teen. Who knows if she might have been another such as her mother? At least she was interred in the royal crypt. Queens who never mothered an heir were sometimes not given that honor. Elisabeth was a special woman! Thank you for giving us the rest of her story!